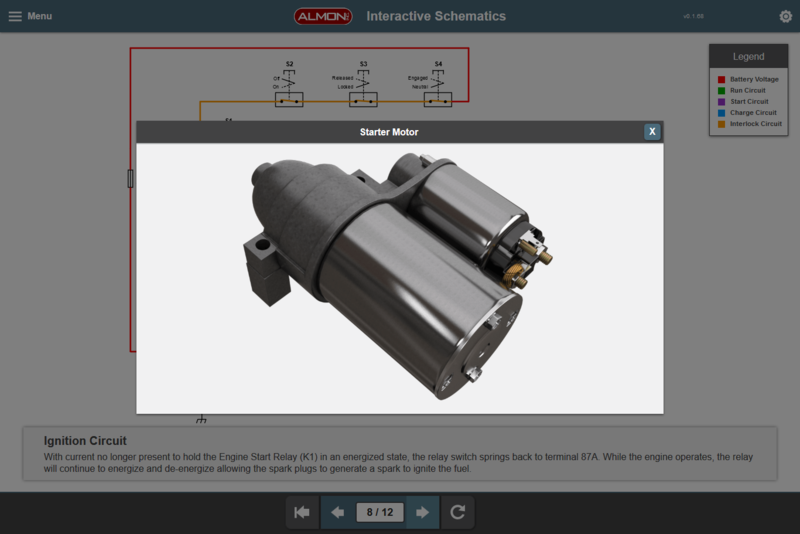 Almon has been developing training materials for a lot of equipment over the years, and the systems that operate them are not getting any simpler. 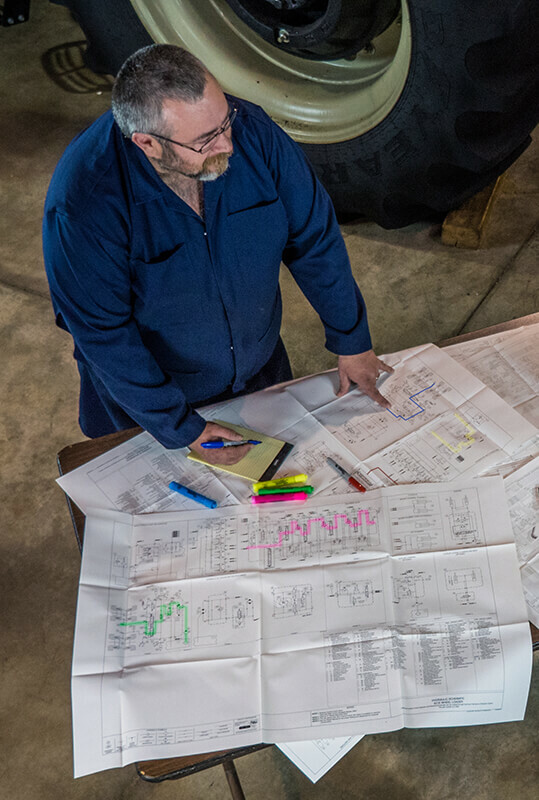 The complexity and amount of electrical, hydraulic, and pneumatic schematics we’re looking at can be staggering, even for a seasoned subject matter expert. The new technician in the field or the student in the class can easily become overwhelmed by the maze of lines and symbols they are looking at when trying to follow along with paper schematics sprawled across a table or attempting to navigate across a multi-paged version in a PDF. 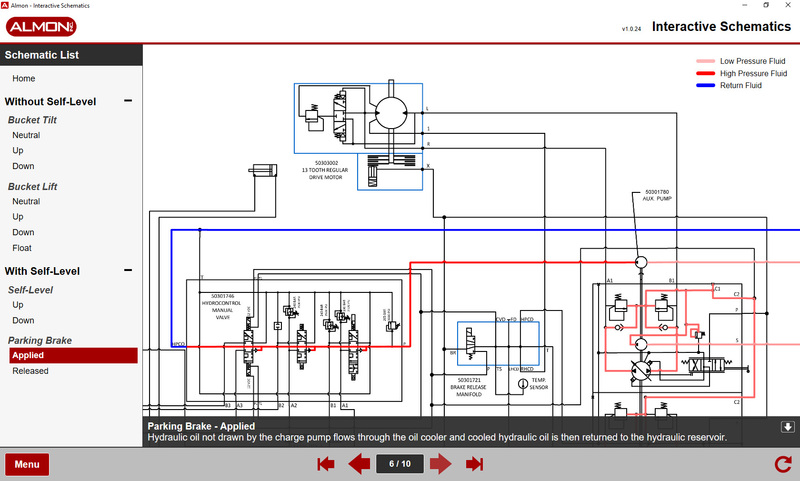 In collaboration with our in-house subject matter experts we develop interactive schematics that will break down the most complicated schematics to something more manageable and understandable. 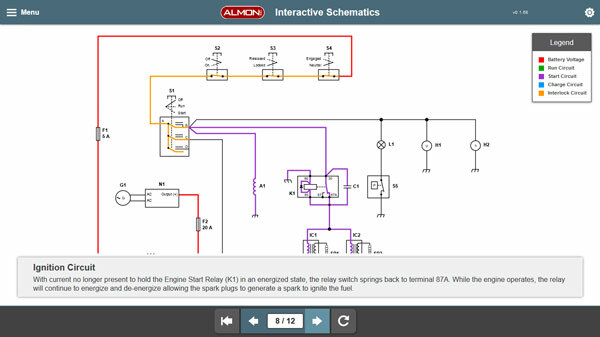 Almon works with our clients to help them organize their schematics and system flows into a more intuitive structure, which becomes the basis of the application menu. We then animate the sequence of each of the flows with a step-by-step description of what is happening as the flow travels from component to component. 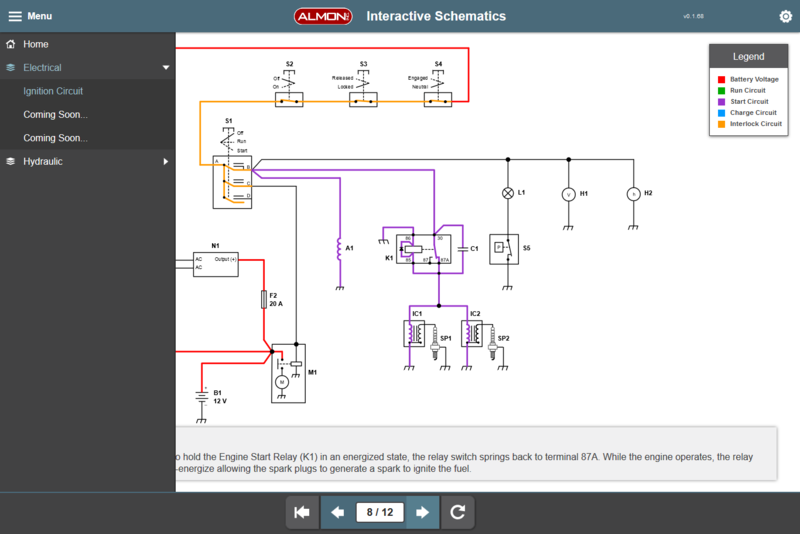 There are many features that can be incorporated into an interactive schematic, but a couple of key items you’ll find are the ability to step forward or backwards through a circuit flow and to move and zoom the schematic while focusing in on a particular area of interest. 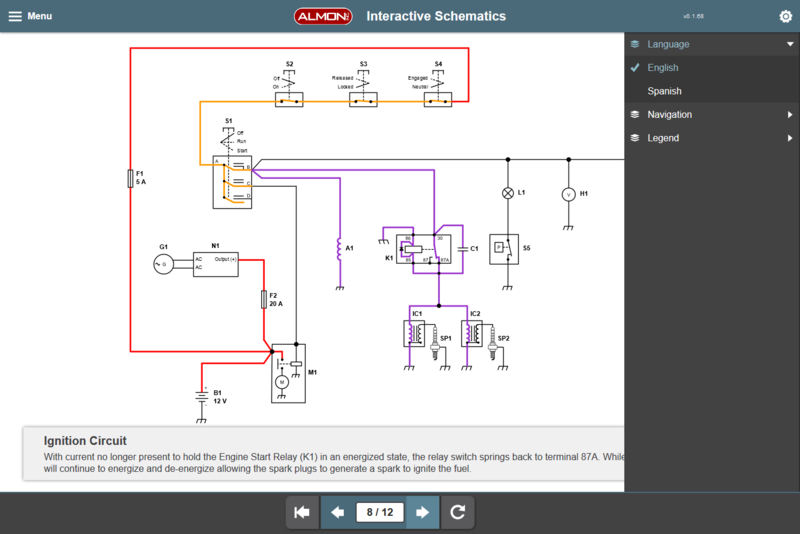 The schematic components can be animated to depict how they will react with the circuit flow. They can also be used to bring up additional information. What kind of information? Well, pretty much anything you can think of. 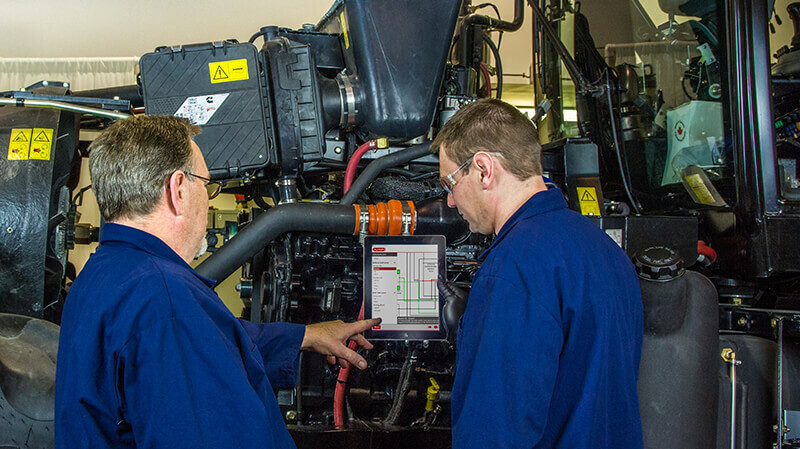 It can be simple such as the components name, image, and part number or we can pop up a separate information window with tabbed data, showing diagnostic videos, animations, and 360° machine views that pinpoint the location of the component on the machine. There is no limit to what can be shown, which makes it a great resource for technical support, diagnostics, and training. We develop them in HTML5 so they can be deployed on a website, a desktop application, or made into a mobile application. This allows you the freedom to take all that information anywhere and to share it with people around the world simultaneously. Now, if those people happen to speak a different language, we have that covered as well because we develop with translations* in mind so that new languages can be added as needed. 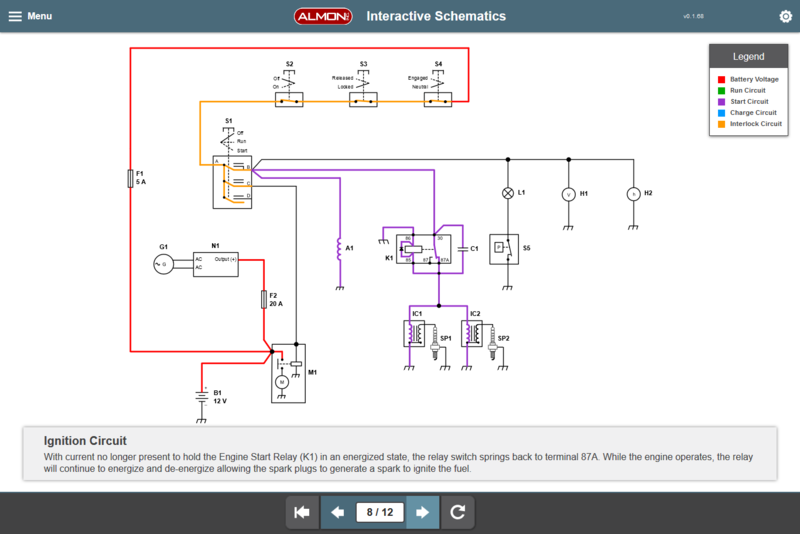 The versatility of the interactive schematics really is limitless. So take a look at a small demo that we have here and decide for yourself if you would rather continue with paper or move on to something better.